Yesterday I tweeted photos of my ‘September 2015 Professional Development Outcomes’ and ‘October 2015 Professional Development Goals’. My reply to Fiona Barr’s comment below made me realise that over the past few months I’ve actually created 40+ hours per month for Professional Development, in addition to integrating learning into my work activities. In effect, I’ve created an extra week per month to invest in my own Development. Doing a little bit, consistently, each day, accumulates quickly into a lot of development and the creation of new possibilities – particularly when I do things that connect me to others and put me in a situation of co-learning. So, in this post I describe how have done this. For context, I work full time, commute by public transport around 2 hours per day (including walking either end of the trip), have a 10 year old child whom I solo parent during the week without extra child-care, and a dog that I walk at least 2 x 30 minute walks per day. I share this detail just in case anyone thinks that they have commitments in their life that would preclude them for investing more time in their development. Note – this is not a prescription, just an example of what works for me. The underlying principles could be adapted by anyone to suit their life situation and preferences. 3) I have a theme (or small number of themes). While I have many interests, I have a small number of themes to orient my professional development activities and minimise the time I spend down rabbit holes (it’s very easy to meander on the internet and social platforms). Currently my key themes are Social Learning, Communities of Practice, Personal Knowledge Mastery and Modern Workplace Learning. It’s probably at least one theme too many, although the degree to which I focus on any one shifts from time to time. 4) I set goals and track my activities. Three months ago I was feeling overwhelmed. I had over-committed to delivering presentations (conferences, webinars) on top of work projects. I felt like I had lost traction and was spinning my wheels. I decided to make a list of what I needed to achieve in August, plan each week’s activities, and track what I had actually done. 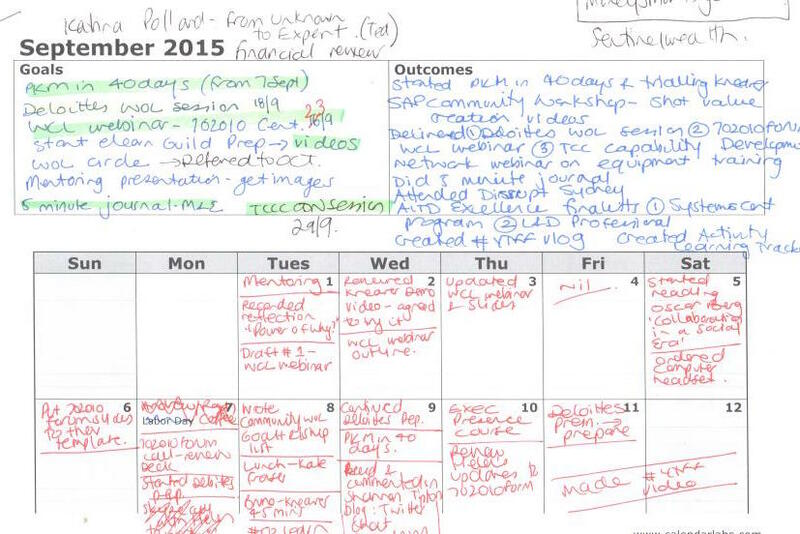 I downloaded a calendar grid, added space to write out goals and outcomes, and took note of what I did each day. This was a high leverage thing to do, and a really ‘easy win.’ Tracking my activities made me aware of how much I was actually doing and helped me to focus on doing the things that would help me most to achieve my goals. It also helped me to be more careful about what I took on. Although it may look like my October list is ambitious, most of this is discretionary and I am not letting anyone down if I don’t get it all done this month. 5) I make the most of ‘incidental’ time. I have around 40 minutes per day sitting on a train or bus 3-4 days per week. During this time I am online – reading blogs (often via Feedly) or online course content, viewing Twitter feeds (I use lists to focus on key themes) or reviewing Twitter chats relevant to my themes, and engaging in conversation online. I spend 7 hours per week walking my dog. I often listen to podcasts or YouTube videos during my walks. Sometimes I dictate a short reflection. Other times I simply let my mind wander and use it for renewal. All of these are good uses of this time. Here’s a podcast directory in case you want to explore podcasts. 6) I am part of a network. I am not alone. I have the force multiplier of a global network of people with similar interests who share good content, engage in conversation, and sometimes co-create with me. I use my network to filter content for me, to spark ideas and help me to gain insight, and I endeavour to contribute by showing my work, being curious and engaging with others. I feel that I have barely scraped the surface of what is possible through networks, yet am in awe of their power and potential to accelerate my professional development. Do you have any other tips for how to create more time for Professional Development or make the most of your PD activities? Please share by commenting on this post. Working Out Loud Circles – Who Will Join Us? 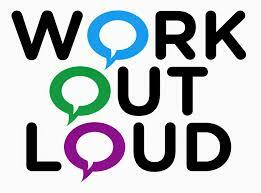 On 12 August I joined an OzLearn Twitter chat about Working Out Loud (WOL). I will update this post with a link to the Storify archive of this chat when it is published. We were fortunate to be joined by Simon Terry who blogs about WOL (amongst other topics). Narrating Your Work + Observable Work. 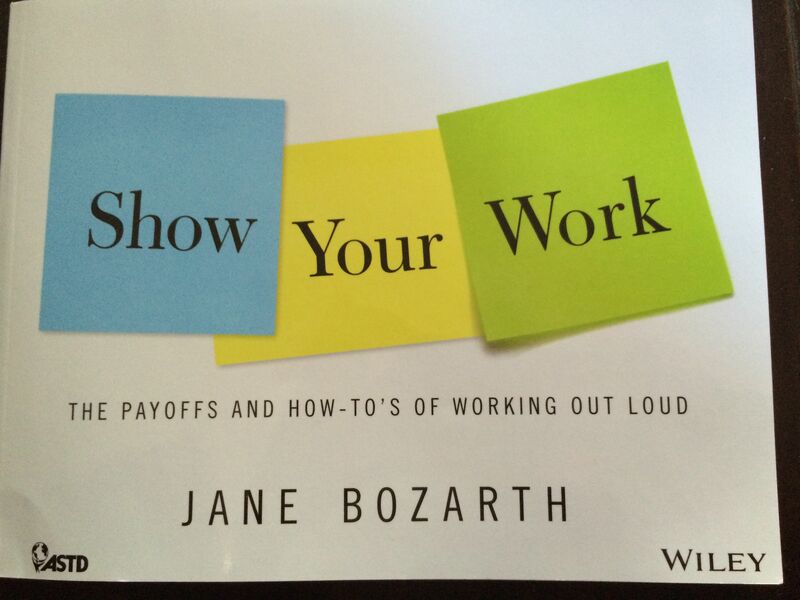 John Stepper does a good job describing what these two elements mean in “Working Out Loud: Your Personal Content Strategy.” Jane Bozarth calls the practice Showing Your Work. Yet, what practices actually constitute Working Out Loud can be a bit elusive. 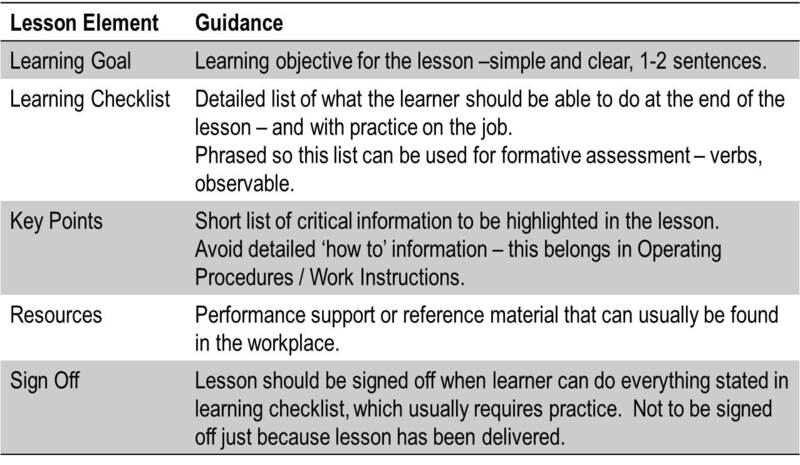 There was a sense during the OzLearn chat that we were all Working Out Loud already, although which of our practices fell into this category and which didn’t was muddy. One thing there was consensus on is that we each derive benefit from our WOL practices, and that the organisations we work in / with can benefit from widespread adoption of WOL. It was Simon Terry who brought the groups attention to John Stepper’s idea of Working Out Loud Circles, which he describes as great peer support group. Stepper describes how to implement WOL Circles, and suggests that they could be systematically spread to reap organisational benefits. The idea quickly captured the interest of a number of chat participants and we’ve decided to set up some WOL Circles in Australia. Each WOL circle consists of 4-5 people who meet for one hour per week over a twelve week period following a structured program. Meetings can be held online or face-to-face. We will use the tool kit contained in John’s soon to be published book. 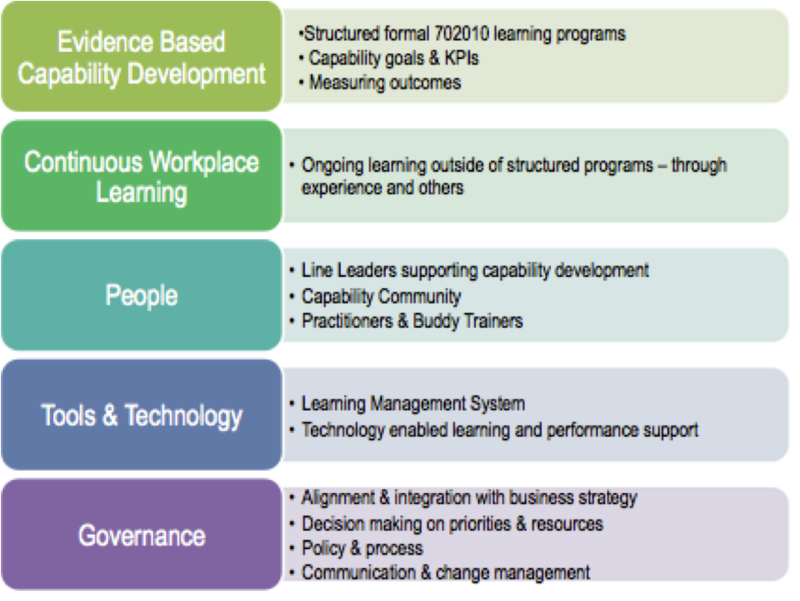 This is not intended to be a program that the OzLearn community ‘manages or ‘controls’ – rather an initiative to provide participants with an opportunity to improve their WOL practices. It will also provide experience with an approach that participants could then use to implement WOL in their organisations. Participation is open to any interested person who is able to join meetings held in Australian time zones. We will kick off the first circles in late August / early September – as soon as we have enough people and an advance copy of John’s book. If you are interested in joining a circle please leave your name and some way of contacting you (e.g. Twitter, email) in a comment below – or get in touch with me on Twitter or LinkedIn. You are currently browsing the archives for the Show Your Work category.